The region of Castile-La Mancha occupies the low tablelands of the Spanish peninsula bordering the east and south of Madrid and is made up of five provinces with each one named after its capital city: Toledo, Ciudad Real, Albacete, Guadalajara, Cuenca. , whose 400th anniversary was celebrated in 2005 throughout the Spanish speaking world and beyond. Castilla-La Mancha is still a land for adventures and exploits. Although largely ‘undiscovered’, or perhaps because of that, it has hidden surprises in each valley, plain, mountain range and around every corner. The word “mancha” comes from the Arabic for a great plain, such as the one in the south of the region. And this gives a clue to what it is like. It is the third largest region in Spain, but it has the lowest density of population - and some would say that here you can still find the authentic Spain. The arrival of the Moors in the eigth century brought in a period of artistic and cultural development greater than that seen under the Romans or the Visigoths. The evidence of which is still to be seen in the mosques and synagogues throughout the region, but especially in Toledo, which ranks with Sevilla, Cordoba and Granada as outstanding centres of Moorish heritage and is - a ‘must’ for any visitor to Spain. The Gothic heritage is best seen in the cathedrals throughout the region, but especially in Siguencia, Cuenca and, of course, in Toledo which has, perhaps, the best cathedral in Spain of this period. People are accustomed to say, and with good reason, that Castilla-La Mancha is quintessentially renaissance. The palace of the Infantado in Guadajara, San Juan de los Reyes and the hospital of the Santa Cruz in Toledo are outstanding examples of this style. 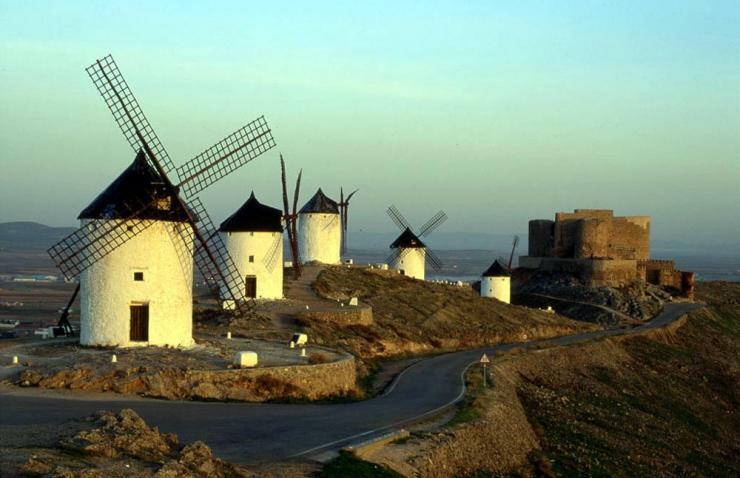 In literature, Miguel Cervantes who,lived in the village of Esquivias, some forty kilometres from Toledo, got to know every nook and cranny of Castilla-La Mancha and its people as he travelled throughout the region as a (wheat) tax collector. The cultural richness of the region has been recognised by UNESCO when it designated the sites of Toledo, Cuenca and the Caves of Albacete as of world importance and heritage. Additionally, by following the trail of castles throughout the region the visitor can relive, in part, the lives, ideas and achievements of those who have given us such a rich inheritance. The region has more than thirty designated countryside areas, the majority of which are to protect fragile habitats of flora, fauna and landscapes. Locations of historical and cultural importance are also included in these areas. However, the most important sites are the two national parks of Cabaneros and Tablas de Damiel, though mention should also be made of the lake of Ruidera, the high Tajo, Hayedo de Tejera Negra, the reserve of the Hoces del rio Cabriel and the startling landscape of the Volcanoes of the Campo de Calatrava. The countryside of Castilla-La Mancha has more to offer than tranquillity. All kinds of country sports are provided - walking, horse riding, mountain biking, canoeing, climbing, bungee jumping and paragliding as well as the more traditional ones of hunting and fishing. Provision is also made for eco-tourism, such as bird watching, which encourages conservation and protection of the environment through enjoyment of wildlife. Festivals are an important part of Castilla-La Mancha life. Some are solely of religious significance while others have their origins from pagan times in the first villages of Spain. However, the two best known are those of holy week in Cuenca and Corpus Christi in Toledo which bring almost all the locals of these towns onto the streets to be then joined by thousands of visitors from around the world. Folksongs and especially dances are the mainstay of festivities throughout Spain, but those of Castilla-La Mancha such as the Sequidilla, Fandango and Bolero have now travelled the world. But the real thing is still here. The best known wines are from Mancha, Valdepenas and Jumilla. And no meal would be complete without the famous Manchego cheese, made from sheep’s milk under the strictest quality control conditions. The region has one national airport of its own, at Los Llanos at Albacete, however, the proximity of Madrid International meets all the needs of visitors from afar. The closeness of the national capital also provides a network of road and rail communication which spreads like the rungs of a wheel through the region. Castilla-La Mancha has been populated since paleolithic times with archeological findings at Alpera and Mineteda(Albacete); Neolithic evidence from Valdepino(Cuenca)and bronze age artefacts from 2500 bc. The first written records of Greek and Roman origin date from 5th and 6th centuries bc, and speak about the settlements at Iberos(Albacete) and Celtiberos(Guadalajara). The first Roman occupation was in 192bc, which bequeathed construction techniques for roads, aqueducts and towns such as Segobriga, Valeria and Toletrum and the culture of a lingua franca and all that goes with that. By the third century AD Christianity had arrived via north Africa and with a little Visigoth help established a hierachical society by the fifth century. In 711 the Moors arrived and brought all the heritage and culture already mentioned. In the ensuing centuries Castilla-La Mancha suffered from a poor economy - often described as - exhausted - due to many factors but including importation of metals from America and depopulation. During the civil war the region was loyal to the republicans. During the 1950s there was much migration to Madrid and the cities of the coast. But new hope arrived when the region gained its autonomy in 1982 and since then it has benefited from European Union help and the greater prosperity, especially from tourism, of the whole of Spain.